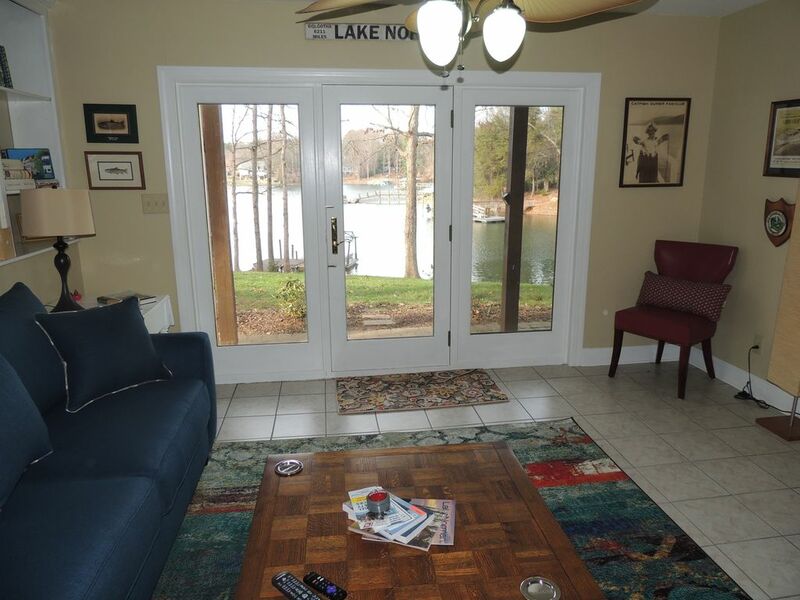 Great Lake Norman view - private Floor of water front house - access to 2 Docks! Lower Level of a lakefront home that has been newly remodeled. Great for family lake getaway. Enjoy the lake from the screened in porch, or from the swim dock. Space to dock a boat on the boat dock in the quiet cove, very close to the main channel near buoy 4A. Full access to lower level of the house, screened in porch and back yard. There is off road parking, and 2 docks. We have 2 very friendly dogs that are quiet and love kids. Great place to enjoy the lake boat rentals available in Mooresville and surrounding towns. Great place and great people! I can’t guarantee that you’ll get homemade chicken noodle soup like we did, but it was fantastic. Thank again! Place was very clean and host were helpful and welcoming. Would suggest if advertized for more than 2 people to put up drapes and add more coffee mugs! We also wrestled with the sheets all night long....not staying put and mattress pad is waterproof so you hear and feel that as the sheets came untucked. Great location, easy access to Lake Norman. Pictures did not do justice to dwelling. Great views of lake. Access to lake via two docks made it nice. We launched our kayak snd paddle boards without issue. My family and I had a very nice stay. The owner was very accommodating and went out of his way in regards to our boat situation. Wonderful quiet cove for playing in the water, but very near the main channel. The pull-out sofa beds were clean and comfortable for our boys, 7 and 9. Nice waterfront view from the living area with smart TV and two large couches. The waterfront location with dock is what makes this place awesome. We rented a pontoon boat and a jet ski and docked them there overnight. Easy access to good restaurants and stores in Mooresville. Screened in porch is good for drying clothes. Not fancy but perfect for a family on a budget who wants to enjoy the lake! Camilla and her husband and son were great guests!